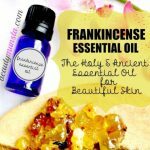 10 Beauty Benefits of Sandalwood Essential Oil for Skin & Hair - beautymunsta - free natural beauty hacks and more! 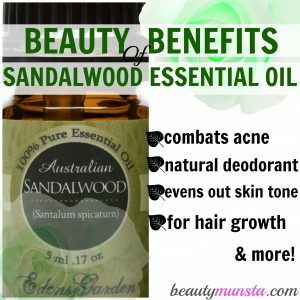 Learn why you should become a sandalwood beauty with 10 beauty benefits of sandalwood essential oil! Blessed with a rich woody and warm aroma, sandalwood essential oil has long been used in Ayurvedic medicine for its aromatherapy properties. Sandalwood trees grow for as many as 40-80 years, after which the essential oil is extracted through steam distillation of the wood from mature trees. It has a long lasting fragrance which makes it a popular ingredient in scents and perfumery. Sandalwood essential oil has anti-inflammatory, antibacterial, antiseptic, anti-aging, emollient, antispasmodic, astringent & cicatrizing properties that give it amazing beauty benefits! 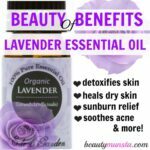 It offers more skin related beauty benefits than any other essential oil and provides benefits for hair as well. Sandalwood essential oil might be more expensive than other essential oils but it’s among the first I bought together with rose, geranium, rosemary and lavender. The best sandalwood essential oil comes from India, which is the origin of the sandalwood tree. Ensure to get 100% pure high quality sandalwood essential oil distilled from real sandalwood trees and avoid the diluted and synthetic versions. If you do not want to get the East Indian sandalwood essential oil, go for the Australian sandalwood oil, which is less expensive but also works effectively. Now let’s check out 10 amazing beauty benefits of sandalwood essential oil to improve your beauty! Acne can be prevented, soothed and eliminated with sandal wood oil. The anti-inflammatory properties of sandal wood essential oil have soothing effects which help calm down acne inflammation and redness. It’s antibacterial and antiseptic properties help to fight off acne causing bacteria and help keep popped pimple wounds clean and germ-free. 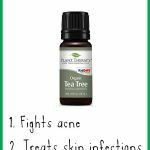 Apply sandal wood essential oil to your acne using a clean q-tip. 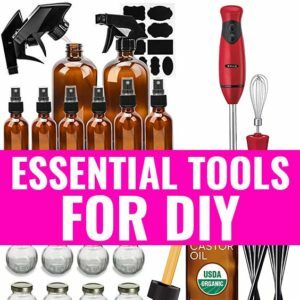 In case you have sensitive skin, mix the sandal wood essential oil with coconut oil/olive oil/jojoba oil before applying. 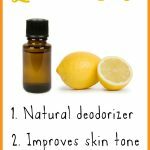 Sandalwood essential oil makes a perfect organic deodorant! Its long lasting fragrance is sure to keep your skin feeling clean and fresh with a pleasant scent. It contains antibacterial properties that will protect your skin from bacteria that are responsible for bad odor. It is known to help with underarm circles, drive away prickly heat, cool the skin in summer and guard against underarm darkening. Simply mix a few drops in 1 oz of coconut oil and store in an amber glass container. Apply just a pea-sized amount with clean fingers. Another beauty benefit of sandalwood essential oil is that it helps eliminate puffiness and swelling in the skin. Anti-inflammatory properties of sandalwood oil are effective in reducing inflammation in the skin and scalp. Mix a drop or two of sandal wood essential oil in 1 tablespoon of olive oil and apply it over rashes/acne/other inflamed skin areas to soothe. Sandalwood essential oil is very effective in healing and fading out scar tissue acne scars, blemishes and dark marks. You can get rid of blemishes by facial steaming. Fill a large bowl or pot with steaming water and add three drops of sandal wood oil. Cover your head and face by creating a tent over the bowl and let the steam penetrate deep into your skin as you inhale. This will not only help strengthen your respiratory system but also help fade dark spots. Sandalwood essential oil has skin lightening properties that helps reduce tan and smooth out discolorations. Add 5 drops of sandalwood oil to 3 teaspoons of coconut oil and apply to uneven tans on your skin. This will help break down the pigment that has reached the skin surface, leaving your skin with an even skin tone. As a well-known astringent, sandalwood essential oil is very useful in getting rid of overly oily skin by tightening large pores and controlling excess sebum secretion. To make an oil-control face mask, mix 1 teaspoon of oat flour with the right amount of water to form a paste. Add three drops of sandalwood essential oil to the mixture. Apply this onto your oily face and let it sit for 15 minutes. When the face mask turns dry and starts to crack, it’s time to rinse off thoroughly with cold water. Moisturize and hydrate dry flaky skin using sandal wood essential oil, which acts as an excellent moisturizer and body massage oil due to its emollient properties. Sandal wood essential oil softens skin by increasing its ability to retain moisture. It will help get rid of flakes and water dry skin, thereby making it look plump and healthy. Place 1 drop of sandalwood essential oil in ½ teaspoon of rosehip oil and massage this onto your dry face before bed. Wake up to perfectly moisturized and glowing skin! 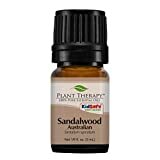 One of the best beauty benefits of sandalwood essential oil is that it contains antiseptic and antimicrobial properties that help destroy bacteria and germs. It will provide soothing relief to itching and redness caused by skin diseases such as eczema, rosacea and psoriasis. Mix 1 teaspoon of sandalwood essential oil in 1 cup of cold pressed virgin coconut oil. Rub this all over the body/ infected areas for a calming effect. Massage your scalp with a mix of 1 teaspoon of extra virgin sweet almond oil and 3-5 drops of sandalwood essential oil to stimulate hair growth and promote long luscious locks. Sandal wood essential oil also helps cool down the scalp, remove dandruff and add fragrance to your hair! Add 3 to 7 drops of sandalwood essential oil to dry locks especially the ends after a shower, to retain moisture and give your dry dull locks a natural sheen. 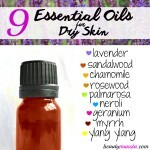 IAs with all essential oils, please do not apply sandal wood essential oil ‘neat’ or directly onto your skin. Mix it with a carrier oil or cold pressed extra virgin oil. You can blend it with a variety of oils, for aroma therapy uses, such as rose, lavender, bergamot, geranium, ylang-ylang, among others.